New and grassroots organizations focused on improving racial equity and increasing social capital. Originally established in response to the civic unrest in Charlotte in late 2016, Unite Charlotte provides early funding for organizations and programs designed to improve economic mobility through social justice initiatives that specifically address racial equity, poverty, civil rights and/or access and inclusion. Grants span from $3,000 to $15,000 with recipients focused on initiatives ranging from providing technology for learning and job training, to addressing the challenges of neighborhood gentrification, to building trust between communities and police. 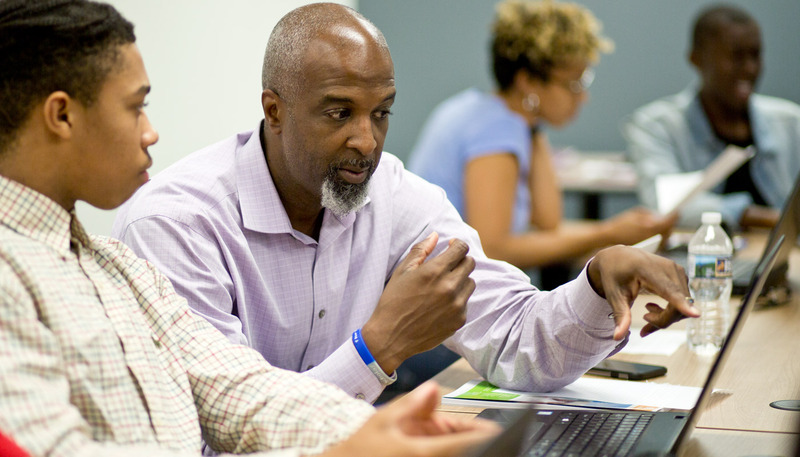 Unite Charlotte also invests in racial equity workshops and training for local nonprofits, offers capacity-building workshops, and provides mentoring to strengthen organization and financial stability, program quality and growth for grant recipients. Motivated by his young daughter’s concern about fellow students struggling to complete assignments because they lacked access to a computer and internet connectivity in their homes, Pat Millen sought a solution to bridge the digital divide in area schools. Frustrated by a lack of public programming in Charlotte inclusive of black tech professionals and startups, Sherrell Dorsey sought a way to boost opportunities in the city for entrepreneurs of color. During the early years of their educational careers, Jason Terrell and Mario Shaw heard a recurring sentiment from their students – Jason and Mario were the first black male teachers they’d had in their classrooms. With nearly 17,000 refugees resettling in Charlotte over the past 20 years, Rachel Humphries saw a need for helping these newly-arrived residents successfully adapt to their new home. Dave Moore understands that young men getting out of jail most often won't be able to secure a job quickly, because he’s an ex-felon himself; the idea for Southside Rides came to him while serving a sentence for dealing drugs. Raised on the west side of Charlotte, Jania found she wasn’t surrounded by options for advancement. After working hard to become a successful philanthropist and entrepreneur, Jania sought a way to fill the void she saw with social capital and opportunity for girls of color in Charlotte.